Easter is perceived in Croatia as time of rebirth and new life. This fact is perfectly reflected in symbols which are most commonly associated with Easter: eggs, spring flowers (especially violets), and food such as spring onions, lamb and young cheese. 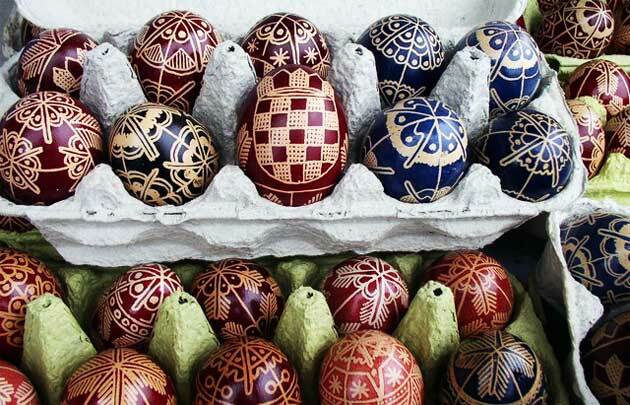 Pisanice (from the Croatian word for “colored”) are brightly painted easter eggs using the wax-resist method and decorated in the different styles of the regions. Before paint became common, villagers used natural dyes made from plants and vegetables. The most common color for eggs was red because of the abundance of red beets. In some areas, soot would be mixed with oak to make a dark brown color, and green plants would be used to make green dye. The most common phrase put on pisanice is Sretan Uskrs or “Happy Easter.” Other decorations are doves, crosses, flowers, and wishes for health and happiness. Simply colored and undecorated hard-cooked eggs remain on the dinner table all day for family and guests to enjoy before the main meal is served, and also to be used in a game known as kockanje or tucanje in which opponents knock their eggs into each other to see whose egg comes out the winner (unbroken). The more elaborately decorated pisanice are exchanged with friends and family. Years ago, it was common for young men to give the girl they admired a pisanica. Croatian word for Easter is Uskrs, so if you want to wish someone happy Easter just say – Sretan Uskrs!